So I’m sure you’ve heard that Canada has finally updated it’s food guide. The food guide was initially released in 1977 and no significant changes had been made since then! The old pyramid/rainbow is gone and instead, we have new, simpler guidelines. One of the biggest changes is that there are no longer 4 major food groups. Previously the 4 groups consisted of meat and alternatives, milk and milk products, grains and fruits/vegetables. Now we have 3 groups – fruits/vegetables, protein and whole grains. The new ‘proteins’ group combines meat, dairy and plant based proteins like tofu and chickpeas. There is a new focus on plant-based protein as it has been shown to lower risk of cardiovascular disease, colon cancer and type II diabetes. The new food guide no longer focuses on servings of each. For example, the old food guide recommended 7 servings of fruit and vegetables every day for adults. The new food guide isn’t focused on specific serving sizes, but instead the new guide is focused on proportions. 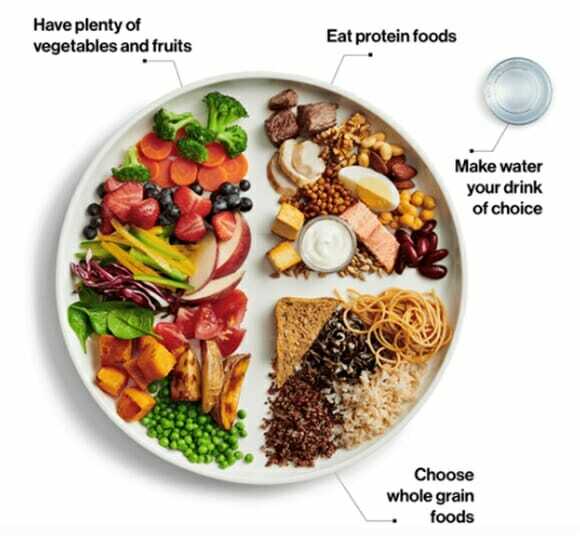 The guide is now pictured as a plate, half filled with fruit/vegetables, a quarter filled with proteins and a quarter filled with whole grains. This is a great change. It was not always clear to know exactly how much of each food equaled one serving. How many carrots? How much chicken? Focusing on eating the three food groups in proportion to each other should be much more manageable on a day-to-day basis. The third change that the new guide makes is discussing mindful eating and food behaviours. If you’ve been a dieter at any point in your life, you are probably familiar with the concepts of scheduling meals and taking your time when you eat. The discussion of ‘how we eat’ is prominent in other cultures, but is just recently being acknowledged in Canada. Planning your meals makes us less likely to pick up fast food on the way home from work. Scheduling time in your day to eat, even when we’re busy, is important to keep our body fueled and our metabolism going. Learning to cook, and enjoying the process of cooking, makes us more likely to eat at home and less likely to eat out. The new guide even makes note of food marketing, and being aware of the influence TV, internet and other social media have on our food intake. We are also warned not to eat processed foods! Avoiding sugary drinks, candies, ice cream, fast foods, frozen entrees, bakery products and processed meats (deli meats, sausages) are all on the list of foods to limit. These foods typically contain a larger amount of sodium, sugar, and saturated fats which are linked to numerous health problems. Other than milk, beverages were not really mentioned in the previous food guides. In the new guide, water is noted as the drink of choice! Now that milk has been removed completely, water should always be the go-to drink. Water intake can obtained from fruits, vegetables and soups or by just enjoying a nice cold glass of H20 all on its own. The other beverage noted in the new guide is alcohol. Warnings about excessive alcohol intake and linking this to certain cancers, hypertension and liver disease are included in the new guide. There is no doubt the new guide is simplified, and much more in-tune with the latest research on food intake and which foods are/are not good for our bodies. The new recommendations come with a number of recipes that can be accessed online that include healthy options for the whole family!